I made these in March and shared them with friends. I was overwhelmed with the feedback I received. Everyone loved them, so I thought it appropriate to repost this recipe today for the final day of National Cookie Week. I really enjoyed researching recipes and preparing them this week. If not for Twitter and meeting The Gay Gourmet, I would never have pushed myself the way I did. Thank you! And thank you to everyone who sampled my cookies. Let’s do this again soon. Preheat oven to 400°F. Line two baking sheets with parchment paper; set to the side. 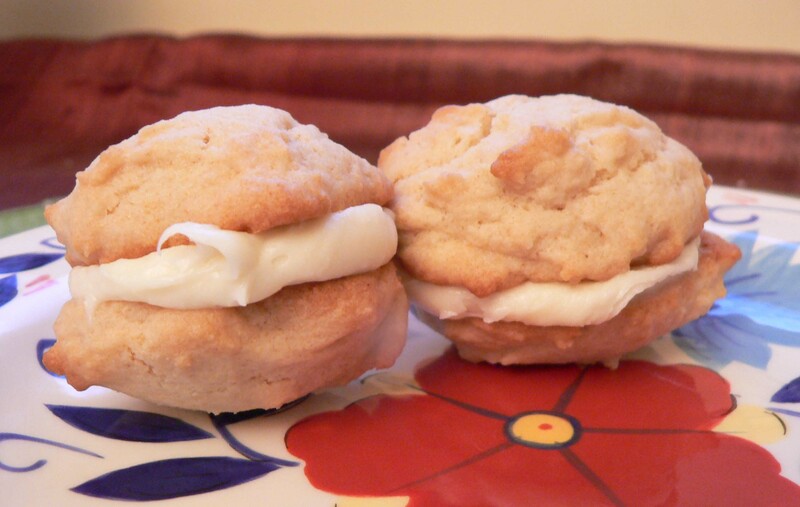 In an electric mixer fitted with the paddle attachment, cream the butter and sugar until light and fluffy. Beat in the egg and vanilla, once again mixing until smooth and light. In a separate bowl, sift together the flour, baking powder, soda, and salt. Add it in 2-3 increments, alternating by adding the maple syrup (begin and end with the flour mixture), stirring after each addition. Between additions, pause to scrape down the sides of the bowl occasionally. Drop by rounded teaspoonfuls onto your prepared baking sheets, leaving 1 1/2 inches around each cookie to allow for spreading. Bake 8-10 minutes, or until golden around the edges and with a dull finish on top. If desired sandwich two cookies with frosting of your choice in the middle to serve. In a medium bowl, cream together the cream cheese and butter until creamy. Mix in the vanilla, then gradually stir in the confectioners’ sugar. *Note- I cut this recipe in half. It produces more frosting than you will need for these cookies.